Noragami Aragoto opens the doors to the ambiguity that was left behind in the first season. The first thing that left many of us confused was what was the catalyst that drove Yato to do what he did to Bishamon all those years ago, causing Bishamon to hold this vendetta to go after Yato's head. If I remember correctly, in the first season Kazuma says something along the lines of, "Yato is our enemy, but he is also our saviour." That quote and the mystery behind Bishamon's hatred towards Yato gets unraveled in the first arc. And let me tell you, I was not ready for that tea. I was gobbling that popcorn when we got to learn that backstory as to why Yato killed Bishamon's former Regalias. Damn! lol. The second arc deals more with Yato and his relationship with Nora, where the ending of the arc shows results that I think many people are satisfied with (including me). But ultimately the reason for the second arc where Ebisu, Yato and Nora go after a Phantom Brush in the Underworld sets up the playing field for what I pray comes soon is a potential third season. Like seriously Bones, why do you have to make me suffer with that huge cliffhanger at the end of the last episode?! Characters are adorable as ever. In my eyes I see a different Yato and Yukine in this season versus the first. I like how in Aragoto, Yukine is more self aware and confident. Where as Yato becomes more reasonable, thankful and compassionate for himself. Of course we still get the Yato and Yukine back and fourth bickering- I live for that stuff. Hiyori doesn't play a big role in Aragoto then she did in the first season, but she's still the same Hiyori we fell in love with in the first season. Bishamon also plays a big role in the anime. I really like her, and I enjoyed watching her have this full circle moment by the end of the first arc. Another aspect I adored about Noragami and Noragami Aragoto is the music. The original sound track is so ominous and interesting to listen to, and certain tracks fits perfectly well setting up the mood and atmosphere of specific scenes. If I could put a label on the OST I'd label it as an enigma. Good picks for the OP and ED. And outstanding OST, one in which I could actually pick up songs while watching the anime. Noratan is my favourite from the OST. Overall, Noragami Aragoto was a step up from Noragami. Bones did a great job with Noragami Aragoto and commanded my full attention to the anime. If you've never seen Noragami before, what are you waiting for? Go and watch it now so you can experience Noragami Aragoto! That's it for this review. 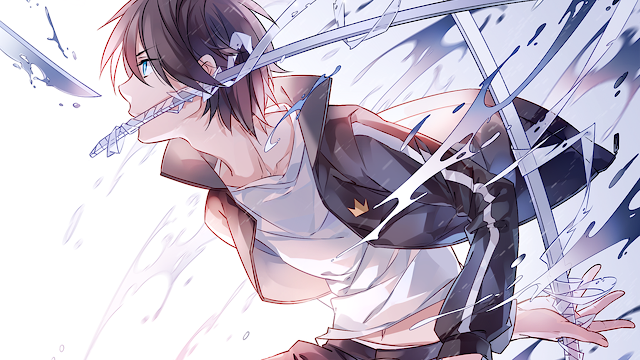 This artwork of Yato was done by iNstockee. Please support this artist and her work at: http://instockee.deviantart.com. Also, please leave a comment down below and share your thoughts about Noragami Aragoto with me! Oh and welcome to 2016! I'm glad that my first post in 2016 is about Noragami Aragoto. I wish nothing but happiness for everyone in 2016. And let's hope for another year of great anime. There is a good and funny ova!! Excellent review! I agree, thanks for reading. I haven't seen the OVAs yet, I'll check them out soon!